Would you like to buy beautiful contemporary original artworks from leading artists, but don’t know where to start looking? Perhaps you’d like to own stunning, original paintings or fine art prints, ceramics, sculptures or glass art, to bring a unique dash of creativity to your home. Maybe you want to bring a brilliant spark of artistic inspiration to your workplace, to fire the imagination and enthusiasm of your team. If you’re looking to buy any kind of modern or contemporary art, Primrose Gallery in Thrapston are the people to call. As Northamptonshire’s premier fine art gallery and picture framers, we have a superb portfolio of artworks from carefully selected high profile and emerging British and international artists. But don’t just take our word for it, come and have a look for yourself. Primrose Gallery was born in Northampton back in 1999, when owner Neil was first picture framing in his garden shed in Primrose Hill. Once customers' work was completed, it was hung on the wall, alongside a few pieces that were for sale. This soon became known as 'Primrose Gallery' to the neighbourhood clients and represented well known artists such as Melissa Dring PS, Michael Little, and Martin Taylor. In 2001, we opened a small art gallery in Derngate in Northampton town centre and swiftly gained a superb reputation for stocking original artwork, whilst offering high quality picture framing. The range also included original printmakers' prints, paintings, and a range of quality studio ceramics. Sadly, due to events beyond our control, the gallery closed down in 2006. Four years later, we re-opened in 2010 in Kingsthorpe and then in Stow-on-the-Wold, Gloucestershire, in 2012. When the lease in Kingsthorpe came to an end, we finally got the opportunity to move out of Northampton - into the lovely market town of Thrapston - and have not looked back since. Come and visit us soon - we’re in the middle of the High Street. If you collect art for your home, office or pure investment, why not join our exclusive Members Club. It only takes a few seconds - is totally free - and will not only save you ££s but ensure you don't miss out on any private events we are running. It's free and you'll receive exclusive discounts, special offers and invitations to our Private Views at various locations ... plus FREE postage on orders over £195. Enjoy! Have paintings that need cleaning or restoring? 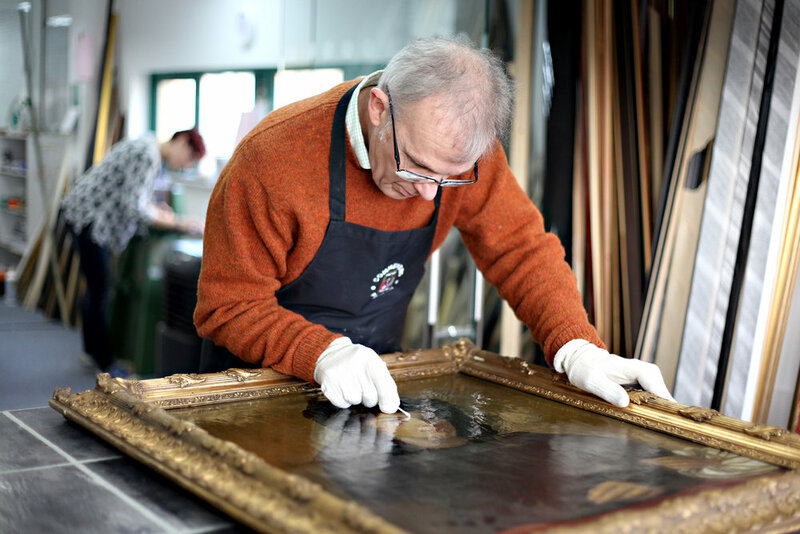 We offer a full picture cleaning, painting restoration, conservation and frame repair service at our framing workshop in Northamptonshire. In fact, we have an award-winning team of Fine Art Trade Guild framers (GCF qualified), providing a full picture framing service for many private and corporate customers. Just bring in your work to the gallery and let us take care of it for you. We’ll let you know when it’s ready to pick up. At Primrose Gallery, we appreciate that purchasing fine art and original paintings can be quite a decision, and one often best chosen when your family or colleagues are around. So, to make the decision easier we offer home consultations – bringing pieces, or a selection of works, to the comfort of your own surroundings. This way, you can see how things look in-situ, check sizes and, most importantly, see if the artworks suit the surroundings as well as how it is to live with the pieces in the space. Moreover, all original artwork for sale can be collected, delivered or shipped internationally. To find out more, call us today on 01832 730022 or drop us an email.